"Founded in 2002, Katy and Philip Leakey are the owners and pioneers of the natural, African-made, sustainable jewelry and elegant, handcrafted products called The Leakey Collection. Both Katy & Philip are impassioned individuals with a strong conviction to connect communities worldwide and to nurture our planet with sustainable practices. Their love for nature combined with their talents in interior design and arts gave birth to a collection of high end fashion jewelry, a new skin care line, and home interior accessories in pure natural elegance! Based in the Rift Valley of Kenya, East Africa, these renowned designers used natural elements of fallen wood, sustainable grass and “bush fired” porcelain to create uniquely exotic products. Each colorful piece contains vibrant design appeal while giving back to those that produce it. The Leakey Collection protects the environment while giving economic opportunity to local communities in Kenya. Its natural elegance distinguishes this high end product line as one of the world's premier offerings. Sold in stores worldwide, The Leakey Collection is also a proud member of the Fair Trade Federation and Green America." The variety of hues in the zulugrass is just brilliant. Easy to color coordinate and decorate your ensemble with one or several pieces of jewelry. 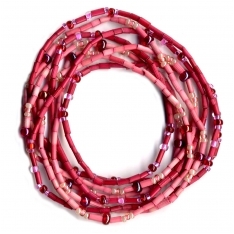 Eco-chic Beaded Single Strands give you 2, 26 inch strands that you can use for bracelets, necklaces, belts and much more. The versatility in this jewelry collection is unique in that you can wrap the strands around and create a different look. 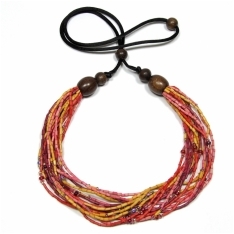 Multi-strand bracelets also come in an array of colors with 2 beads from fallen acai wood on the ends. Easy to slip on your wrist and more glitzy than the single strands. 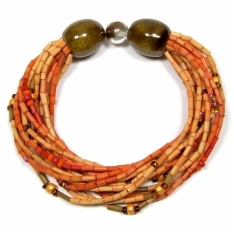 Beautiful Multi-Strand necklace to coordinate with your bracelet. 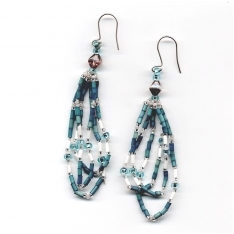 Zulugrass Earrings add beauty to your finished look! "The Leakey Collection is dedicated to uniting caring communities worldwide with the rural women in East Africa by using commerce as a vehicle. Our goal is to enhance people’s lives by creating work opportunity for the Masai in an environmentally- friendly, sustainable way while maintaining cultural and traditional lifestyles. By designing high-end, handmade jewelry and new ways of working with sustainable, natural materials, we can maintain environmental and cultural integrity and create lifelong opportunities for Kenyans in an environmentally, sustainable manner." Find innovative uses of natural materials to create a line of beautiful lifestyle and fair trade products for the contemporary global marketplace with the purpose of creating employment opportunities for rural Kenyans. Train and educate people in sound business practices in order to enhance their chance for employment, entrepreneurial opportunities and lifelong opportunities. Maintain environmental and cultural integrity. Member of the Fair Trade Federation and Green America. Stunning collection that is putting work in these beautiful people's hands. Taking skills they have to produce a product and income for their families. I love companies with such a strong mission as the Leakey's have. Please visit their website for more information and beautiful pictures of Africa! What beautiful colors! I love that they use natural products and they are fairly traded goods! I love this jewlry! The colors are great and so fun! !